The chessboard is from My Craft Studio ‘A Very Important Date’ and the woman is from Debbi Moore My Fair Lady Theatre Boxes. Here's a clean(ish) and simple card - actually most of my cards are pretty simple but this one is even more simple than most! The stamp is by October Afternoon and the papers on the shorts, flag and Tshirt are scraps. I've just completed my first week back at work after my 4-week summer break. Thank goodness there's a bank holiday on Monday!! 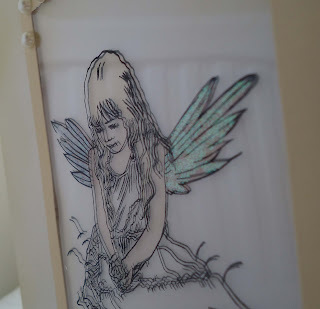 The fairy and the mushrooms are two separate digis from Crafts and Me and I used 3 different papers from a Memory Box paper pad. There's plenty of glitter on the wings but it doesn't really show up in the photo. 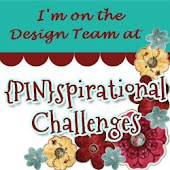 The CD Sunday Challenge is such a friendly blog, I like to take part when I can. 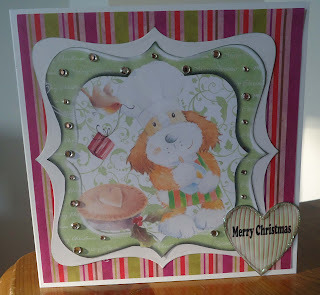 This weeks challenge is 'Cute Christmas' . All the images including the frame,bird and heart are from Papermania Christmas Past CD, except the dog which is from My Craft Studio Smudge CD . 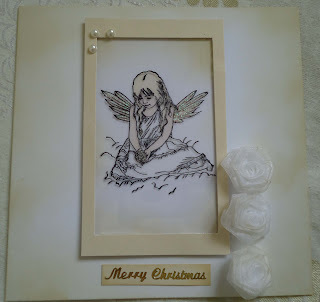 The stripy background paper is from a magazine freebie paper pad \nd I added gms and glitter glue. 'Hot stuff with a hat pin...' it's a quote from a Pink Floyd track - but today I hope you will think it describes me!!! 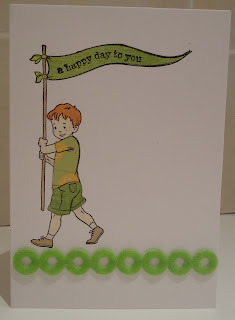 The houses and sentiment are by Little Claire ; I used a Stampin Up punch to cut out the sentiment. The heart headed hat pins are by The Hobby House. 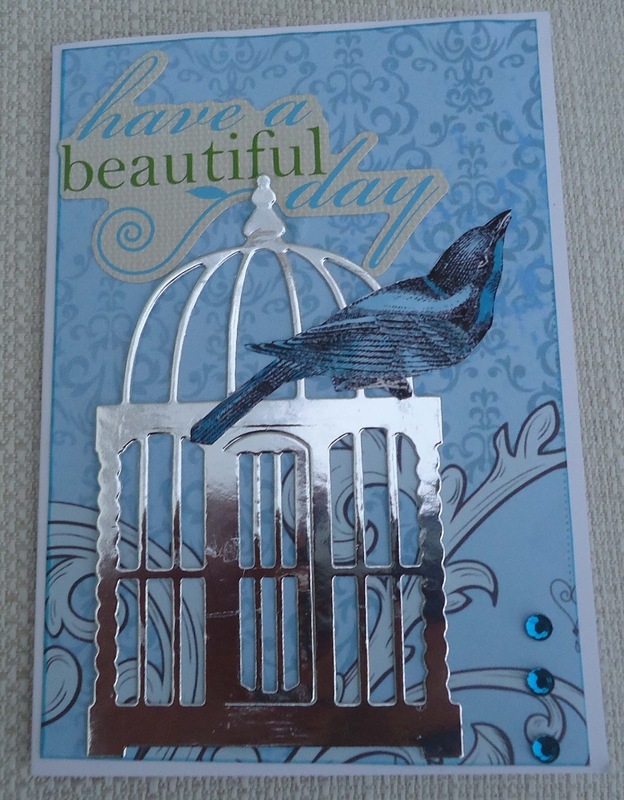 Here’s another one I bought at Stamperama last week. The stamps are by Little Claire – there’s the window and there are stamps of the garden in all four seasons – so expect more variations of this! 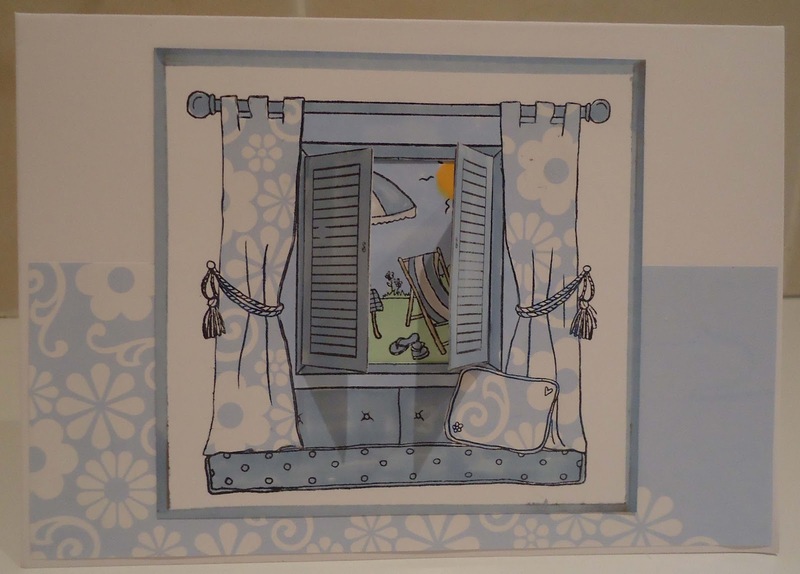 This is another one of those pesky cards that are difficult to photograph. I stamped the skaters (October Afternoon) onto acetate and coloured from the back with alcohol pens and OHP pens. 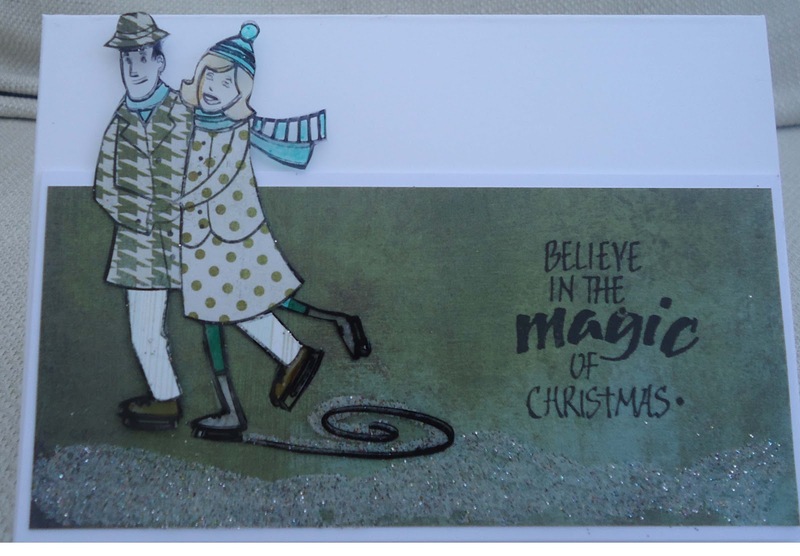 Then I paper pieced onto the front for their coats. I half-stuck them onto a panel that I raised from base card with 3D foam, so they are kind of floating (or hopefully, skating!) in front. 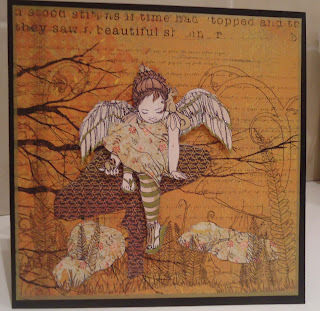 The paper scraps are all Basic Grey and the sentiment is by Crafty Individuals. 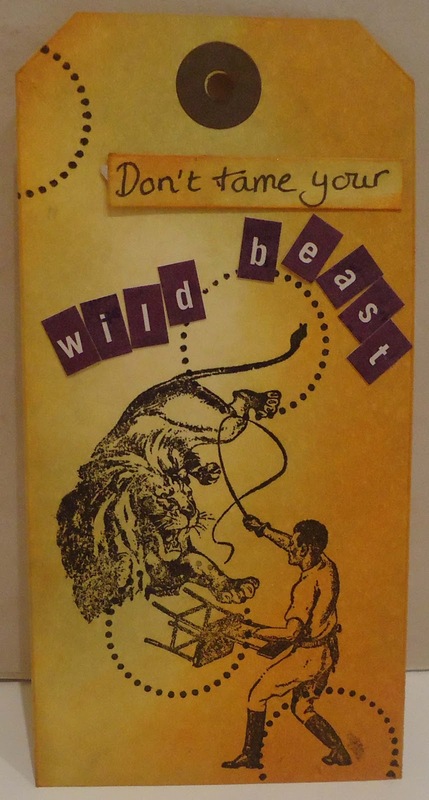 I originally made this card for the Artful Times acetate challenge, then realised that after I'd chopped it about it didn't quite fit the brief! (Originally this was a layer of acetate). 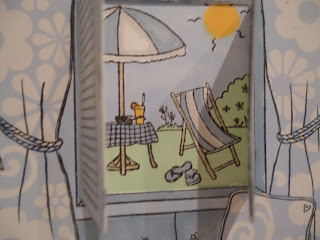 Here's (I hope) a sunny card, using a Mo's Digital Pencil Image and the colour combo from Make My Monday. 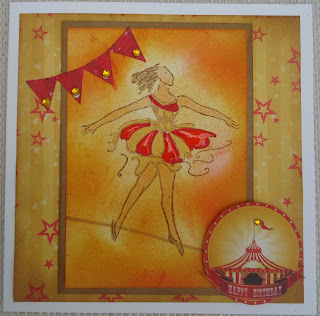 This stamp (Judikins) is another old favourite : I’ve previously had her ballet dancing and skipping through flowers but today I’ve sent her up on a highwire to be a circus tightrope walker! What an exciting life she leads. 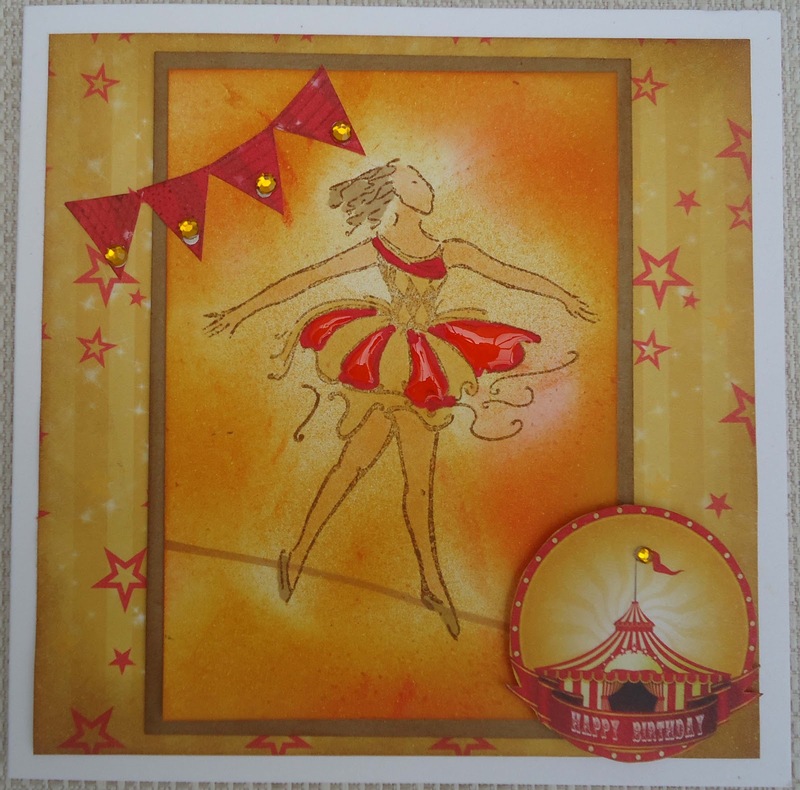 The papers, including the circle with the big top , were freebies with Making Cards magazine. 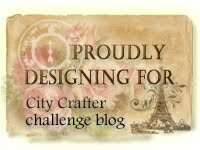 The banner was made from a Kaisercraft stamp. I found it quite hard to get a photo of this without my face reflected in the acetate! 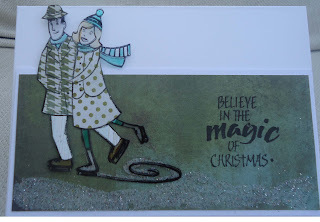 This stamp is by Sweet Pea Stamps and is another of my Stamperama purchases. 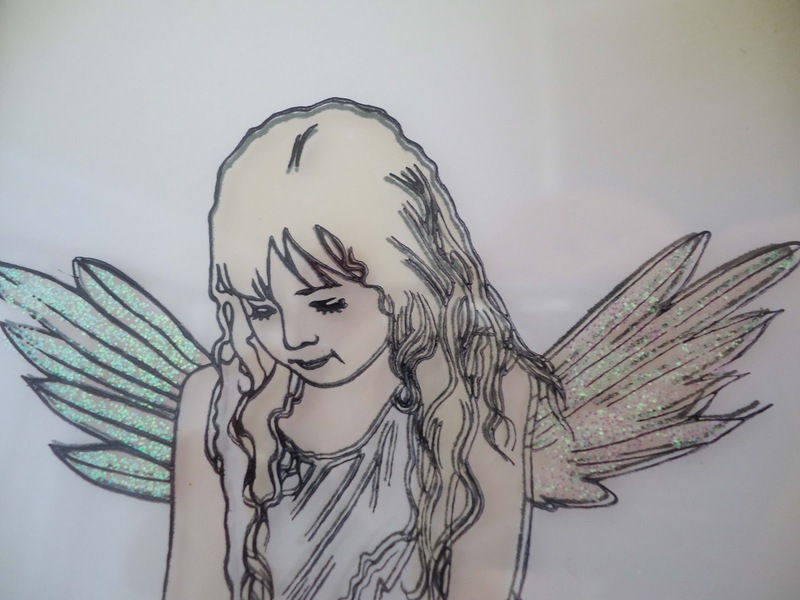 I stamped the image twice, once onto card, once onto acetate. 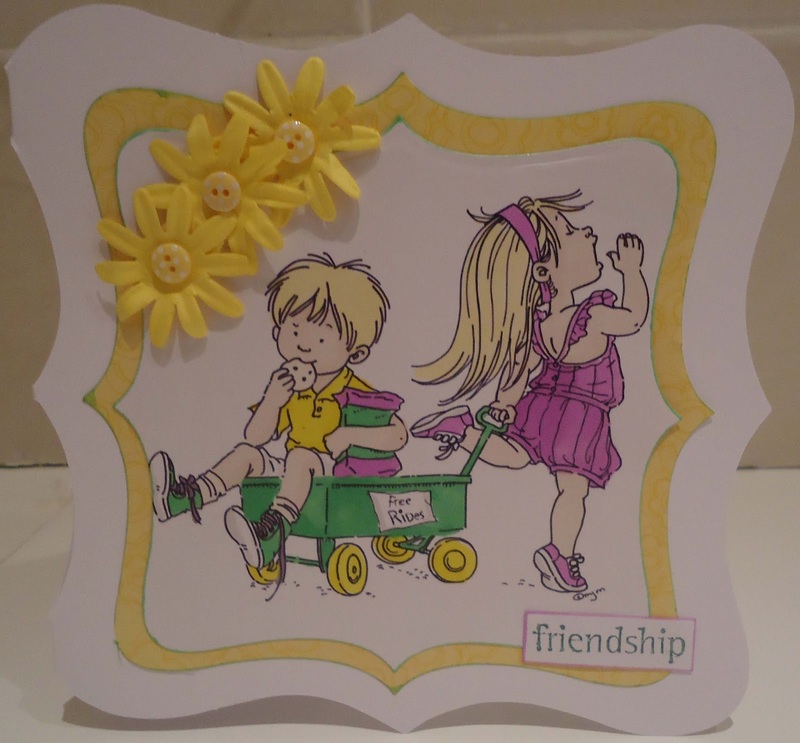 I coloured the card using soft shades of Promarker. 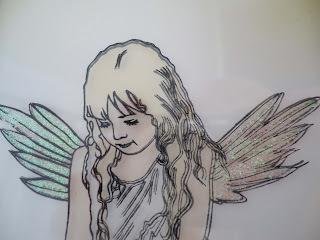 I glittered the wings and flower on the acetate . 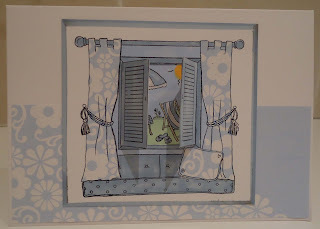 Then I sandwiched them together using 3d foam and added a frame. It gives a sort of 3d effect when you look at it from different angles but again, hard to photograph! 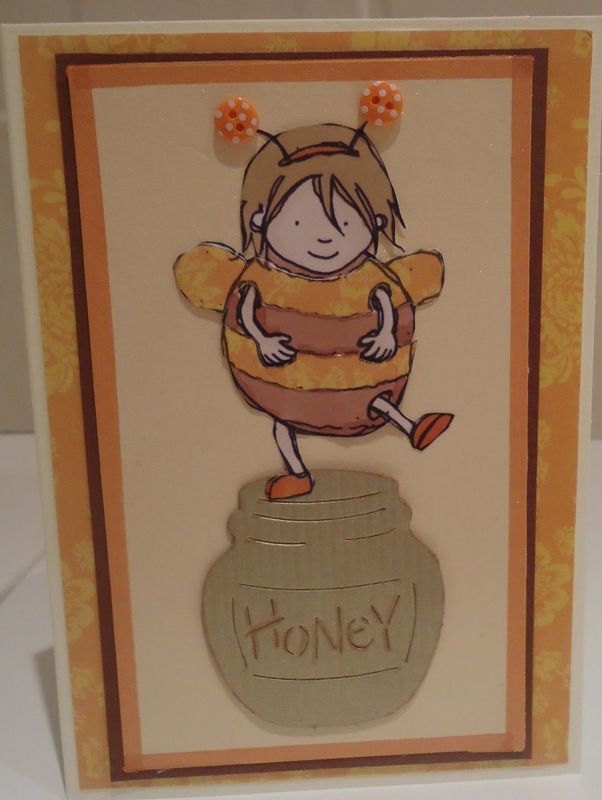 I've had this Sizzix die of a honey pot for years. 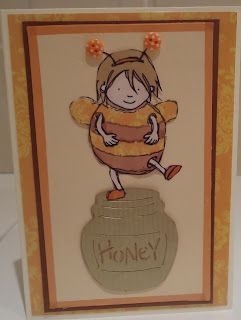 Last time I used it I had Winnie the Pooh on top; this time it's a cute girl in a bee suit from Jellypark. 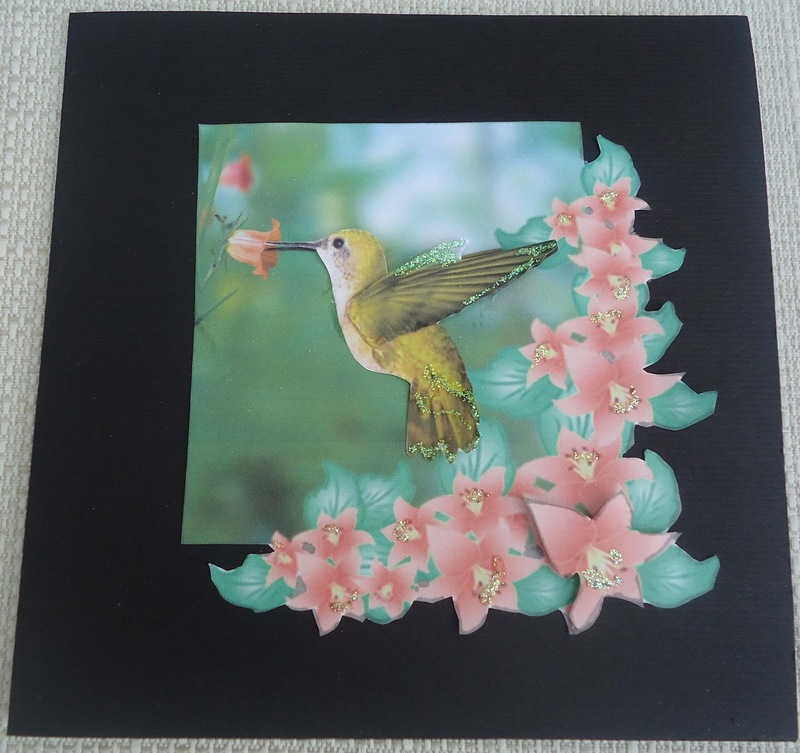 I made this card for CD Sunday Exotic Birds and Blooms challenge . 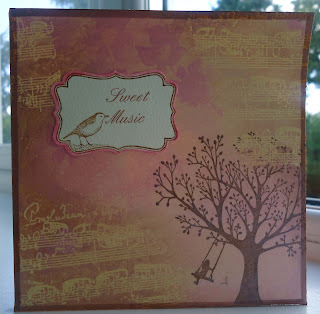 The images are from My Craft Studio Wings and Things and I did 3 layers of decoupage on the bird and added stickles all over the place. The latest Fashionable Stamping Challenge theme is ‘ice cream colours’ and I’ve been thinking and experimenting for a few days, trying to come up with a Neopolitan ice cream background. Eventually I remembered an old watercolur palette of US Art-Quest pearlescent pastels that had just the right shades for chocolate and strawberry. Simultaneously, I’ve also been thinking of an idea for ‘Out of a Hat Creations’ challenge – ‘All Parceled Up’. I have some blank CD cases and they are just right for a rich creamy vanilla. 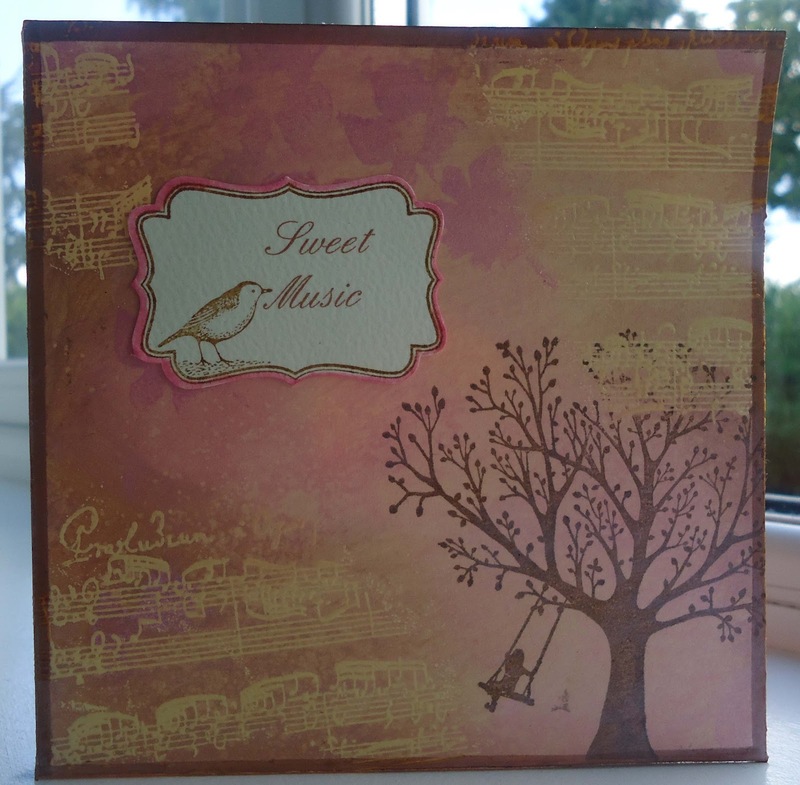 I randomly stamped the music stamp (Toybox) in Versmark and clear embossed. Then I wet the watercolour pastels and sponged them on thick with a kitchen sponge. I sprayed just a little water where the strawberry and chocolate met, to blend. Other stamps I used were Hero Arts watercolour flowers and the tree swing and label from Stampin Up. 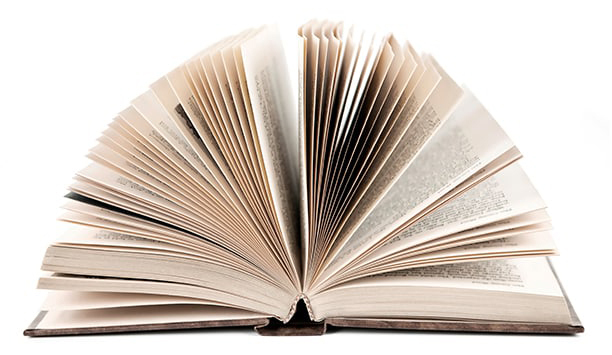 As well as FSC and Out of a Hat, I’d also like to enter this for Creative Card Crew – Maps, Newsprint,sheet music, script. I went to Stamperama stamp show this morning , and came home a poorer woman. 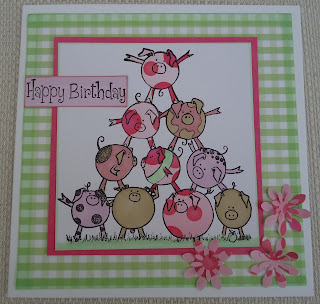 I bought this pig stamp (Dimensions) and got straight to it! 6.08am and I'm uploading this card. 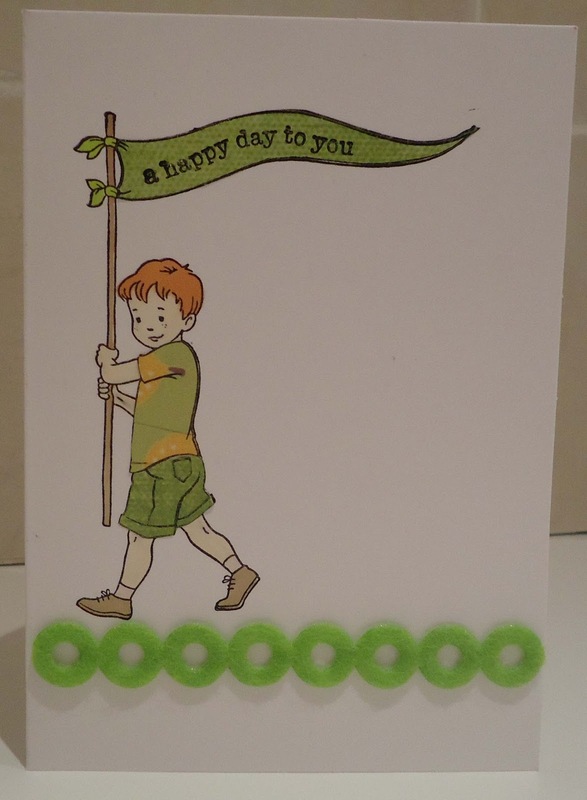 I started to make this card last night at around 7pm, when my little boy was playing in the garden. I had to break off to bath him and put him to bed and then resumed cardmaking. Little boy gets up - can't sleep - sits there watching me and fiddling with things. I go to die-cut the cage and realise the base plate for my Big Shot is missing and start search of the house. Boy gets bored and goes back to bed. 9.15 Phone call from my grown-up daughter - she's had a row with her partner and she's on her way round with a bottle of Rose. Half a bottle of wine and two cocktails later, she goes home much happier and I resume search for base plate. Realise I'm unsteady on my feet and go to bed. 5am- I wake up still worrying about the base plate and resume search. Find it in inappropriate drawer. Complete card. 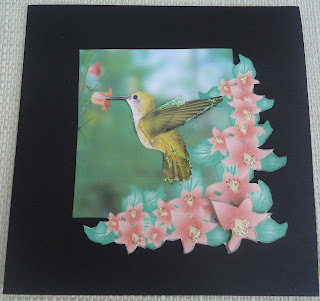 I used a digital stamp from My Craft Studio Quintessential Country Garden CD and I coloured it with Promarkers. Paper is from same CD. 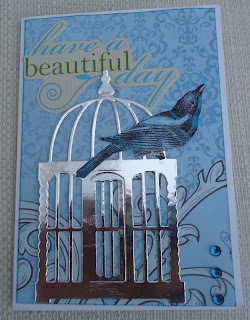 Cage die is by Marianne and sentiment is a Papermania sticker. 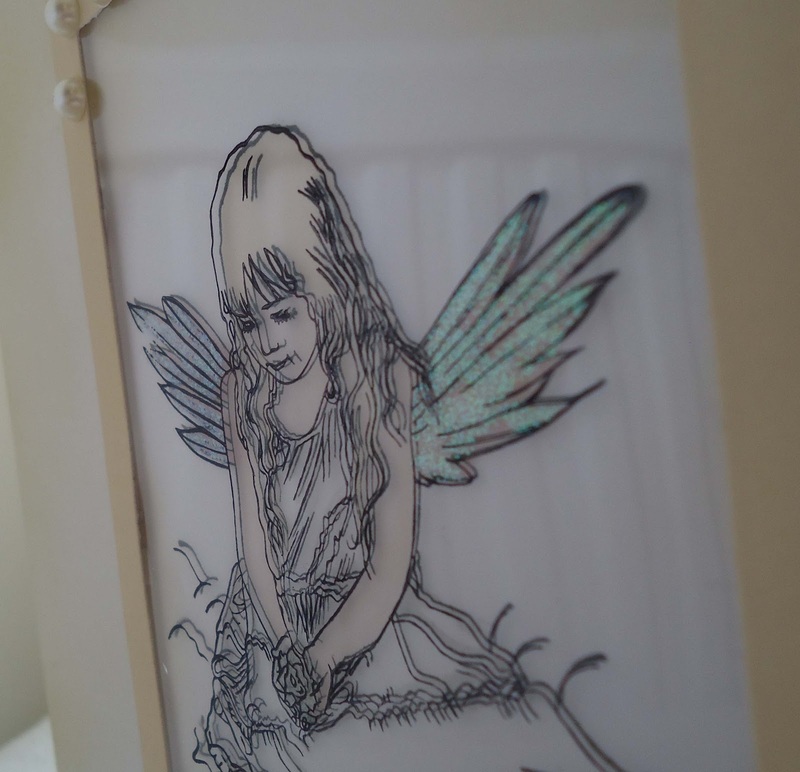 Back in the craft room and here's a quick and easy tag for you - well, it would have been quick and easy for anyone else. For me, this was the third attempt! 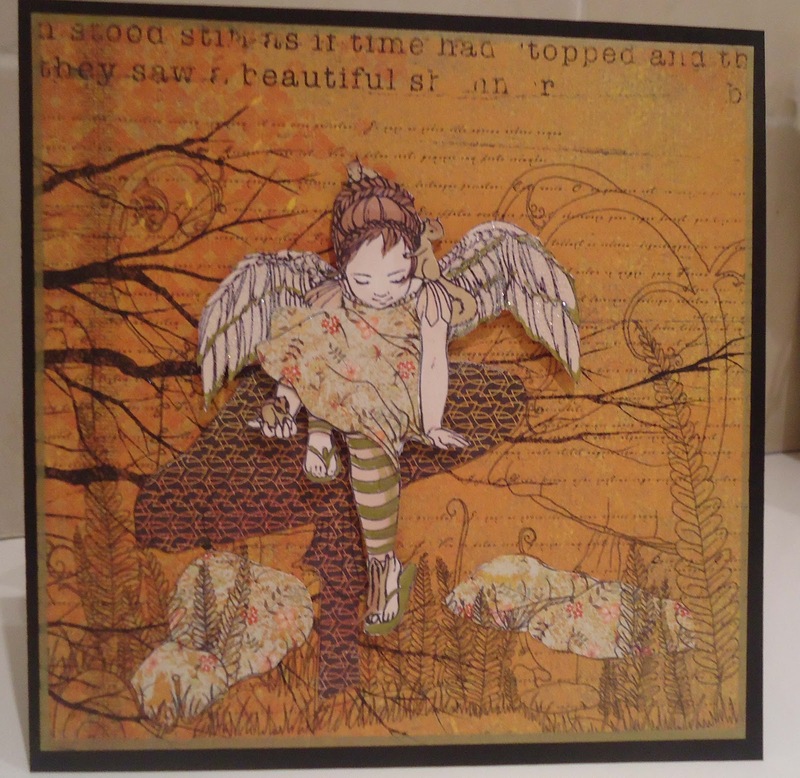 The inks are Tim Holtz, Shabby Shutters and Spiced Marmalade. 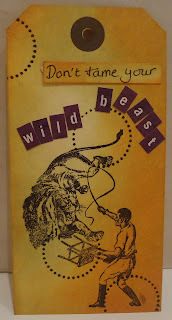 The lion tamer is Hampton and the circle is Hero Arts. Hi! Just got back from France and couldn’t wait to get back to crafting. 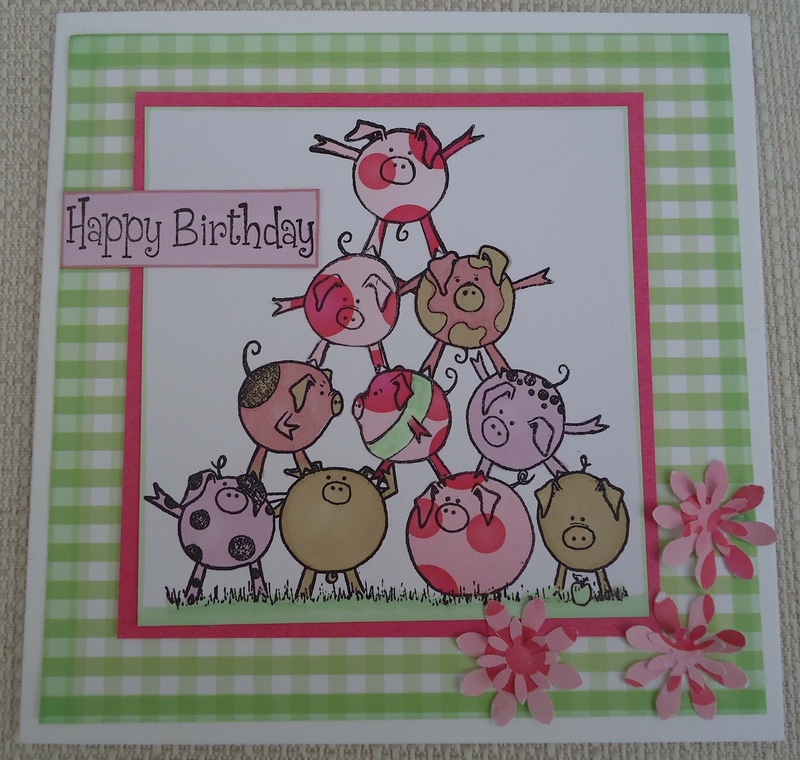 I just received the new A Day For Daisies club kit and this, combined with the Mona Lisa challenge from Artful Times, gave me the idea for this card. 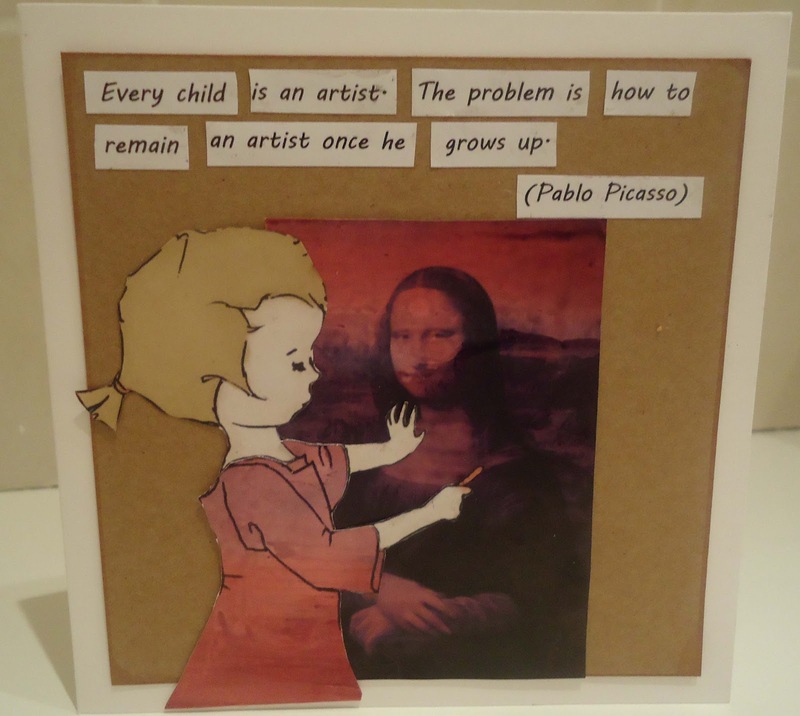 I thought it’d be fun to have a child paint the Mona Lisa. I cropped the ADFD image, to remove the childish drawing included. I found a black and white image of the Mona Lisa online and printed it onto some card that I’d made when experimenting with inks last week. 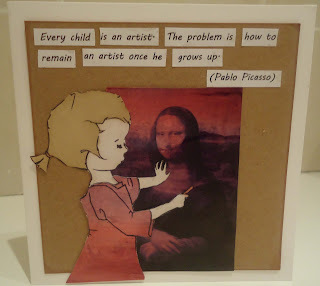 I printed out the child, cut out and coloured it, and then paper-pieced with some of the same inky card. I printed and cut out the quote.